Blogging is hard. I don’t post regularly, and then when I come back after a few months, I feel like I have to write a novel about the knitting I have done since my last blog post. So, I have a new challenge for myself (maybe a new year’s resolution?). I am going to keep posts to 300 words or less, minus photo captions! So I present my latest test-knit sweater: Winter Rain by Jenn Emerson. The title is quite apt for the weather we’ve had in Minnesota – lots of rain, no snow, and warmer-than-usual weather. But it’s still been great sweater weather, and I have been getting a lot of use out of this fantastic piece! Beautiful fall foliage…except it’s December now. Look at those colors…I chose Malabrigo Rastita in Piedras. A slightly fuzzy photo of the backside. But my hair bun looked cool, so I HAD to include this photo. I’m drooling – look at that color! It was a relaxing knit, minus the meticulous pre-planning I did in order to alternate my skeins due to slightly different shadings of yarn dye. Can you tell the ribbed edges and pocket are differently shaded than the body? I did not alternate in those areas. 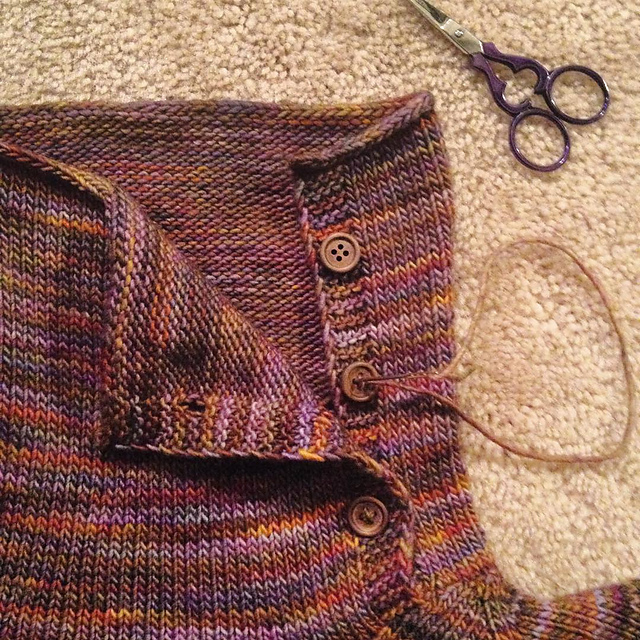 I also thought I had the perfect buttons for the “cowl” neck – but then my buttonholes turned out too small, so I had to find new buttons. And guess what…I found some awesome wood buttons at no other place but Wal-Mart. I LOVE the neck, the kangaroo pocket, and the subtle princess body shaping. It’s a new favorite! For you knitters, check out my VERY detailed notes on my Ravelry project page.